Dallas Vintage Shop has this Supreme Quality Virgin Mary Costume & Halo for Nativity Scenes & Christmas Pageants & Plays. This ‘Heavenly Bodies’ Met Gala Aura Halo comes in several styles. 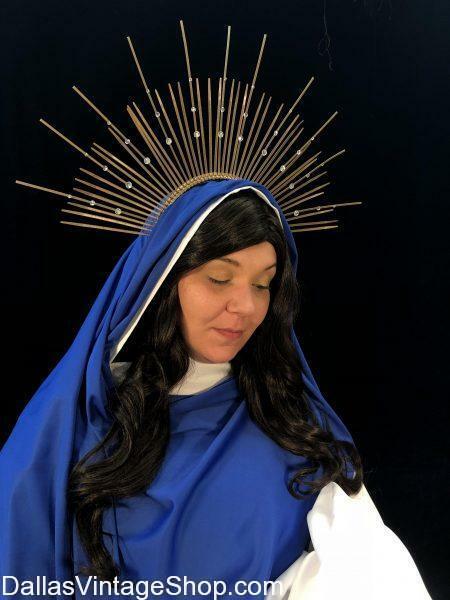 This Virgin Mary Costume Halo is just one example of the quality and details you will find for all of your Christmas Character Costumes and Sunburst Crown Headpieces we have in our Dallas Area Biblical Costume Shop Mega Collection. You will find Heavenly Bible Characters & Saints Sunburst Auras, Halos, Crowns & Headpieces in several styles at Dallas Vintage Shop. These ‘Heavenly Bodies’ style Met Gala Halo Crowns are perfect for Christmas Biblical Plays, Nativity Scenes, Holy Church and Bible Character Costumes & Accessories. Get Theatrical Quality Halo Crowns that will make your Virgin Mary Costume amazing. You will find stunning complete costumes for all of your Biblical Christmas Characters and Historical Saints. There are Supreme Quality Biblical Characters and Saints Outfits and Median Priced and Economy Priced Costumes & Halos in a huge variety of styles and price points.